An impacted tooth simply means that it is "stuck" (ankylosed) and cannot erupt into a functional position. 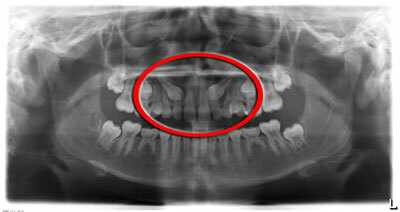 Patients will frequently develop problems with impacted wisdom teeth. See here for further information regarding wisdom teeth. The maxillary cuspid teeth (canines) are the second most common tooth to become impacted. It is also common for other adult teeth to become impacted and require exposure. The canine tooth is critical in the dental arch and plays an important role in your "bite". They are designed to be the first tooth that touches when your jaws closes together so they guide the rest of the teeth into proper bite. Normally a canine, or eye tooth, erupts into the dental arch between the ages of 11-13. If it is in an abnormal position or buried behind the front teeth, Dr Webber will work with your dentist or Orthodontist and perform a minor surgical procedure to uncover the canine. Dr Webber will bond an orthodontic bracket after exposing the tooth. This allows the Orthodontist to gently traction the tooth into a normal position immediately following the surgery. Please click here for post-operative information.